Learning to play is as much about learning the language of the game as its techniques. Given the game's Scottish roots, there are some much loved terms that, sadly, have not stood the test of time. Take Mashie niblook. This has always been guaranteed to bring a wry smile to the face of the uninitiated, but it is in fact the more colourful, and certainly more endearing, name for a seven iron. On a more practical note, if you hear the distant call of "fore" and you find yourself the only one not ducking for cover, then perhaps it's time to start taking notes. Here's what you need to know to take to the course with confidence. The grass platform from which the first shot on each hole is taken. 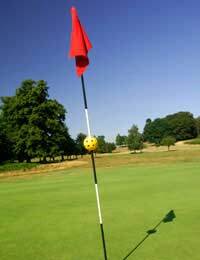 This term also refers to the plastic or wooden peg used to raise the ball above ground level for a tee shot. The mown stretch of grass that provides a clean stretch from the tee to the green which, in turn, is home to the hole, the position of which is indicated by a flag. Long, unkempt grass bordering the fairway that lies in wait for wayward wood or iron shots. A hollow filled with sand, bunkers can be found both on the fairway and surrounding the green, and are the most recognisable, and sadly most visited, hazard on the course. The average number of shots that should be taken in playing the ball from the tee and in to the hole. Has come in to common usage in the phrase "par for the course", meaning to be expected. In simple terms, if the par for the course is 72 and you take 72 shots to complete the 18 holes, then you've made par. Not a reference to one of the wives of the Ryder Cup team, as some less than politically correct newspapers recently stated, but completing a hole in one shot less than its designated par. Taking two shots less than the par for a single hole. Now, that's just showing off, isn't it? Not a term that ever enters most golfers' vocabulary, it denotes taking three shots less than the par for a single hole. This one sounds more familiar: taking one more shot than the par for a single hole. Double bogeys are another common occurrence. Surely the most embarrassing shot in the game. It occurs when the player strikes the ball with the part of the club where the shaft meets the head, known as the hosel. More commonly experienced by beginners due to poor weight distribution resulting in a defect in the swing, the shank nevertheless has on occasions arisen during rounds by much more experienced individuals. A shouted warning when other golfers are deemed in danger from being hit by a wayward ball. After an exhilarating round of golf, why not an equally exhilarating round of drinks to congratulate or commiserate? In short, the term refers to the clubhouse bar and is one that sociable golfers like to reacquaint themselves with on a regular basis.